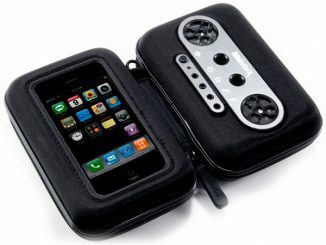 Last month we introduced you to the new iMainGo XP, a portable iPad speaker case from Portable Sound Laboratories. 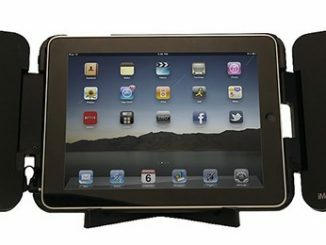 It short, it is a way to boost the audio volume and quality to match the high definition video capabilities of the Apple iPad. 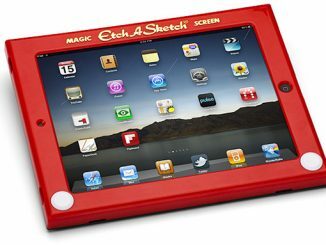 This makes watching movies and playing video games on the iPad much more immersive and entertaining. Fortunately they sent us a sample to test out, and we’ll see if it lives up to the promise in this iMainGo XP iPad Speaker Case Review. Even though you plug into the iPad headphone jack, you aren’t losing out on the ability to use headphones. The iMainGoXP actually has two headphones jacks, so you and a friend can both listen to earphones when your iPad is inserted in this case. 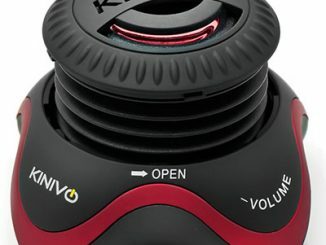 The iMainGoXP has a built-in lithium-ion rechargeable battery. This is great because no one wants to buy batteries, and if it somehow ran off the iPad’s power, you would run out of batteries very fast. 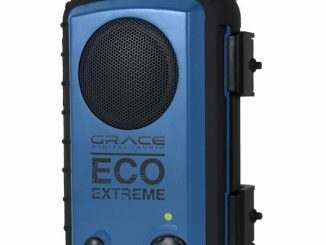 This battery has a really nice capacity too, as it can run at full volume for 8 hours. A plug-in wall outlet charger is included for recharging the battery, and an LED indicator switches from red to green when a full charge is reached. When the iMainGoXP is closed, it is easily portable. It is quite a bit bulkier than a bare iPad, but still small enough to easily fit into a backpack. 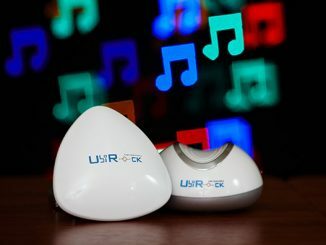 It is definitely a lot more convenient than transporting a set of external speakers. 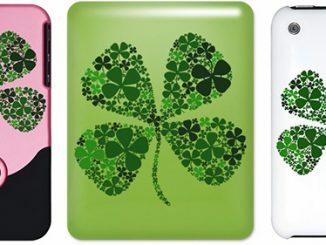 The case will also protect the iPad if you drop it, although unlike cases meant only to provide protection, such as neoprene sleeves and silicone cases, the iMainGoXP itself will likely suffer damage in a fall. 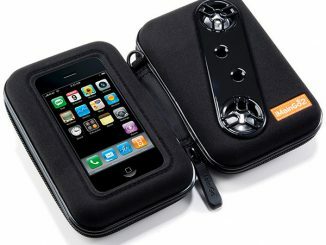 The case is made of plastic, but has a rubber coating that you sometimes find on luxury electronics devices or the remote control of a high-end receiver. This rubber coating provides a really nice feel and doesn’t show fingerprints. 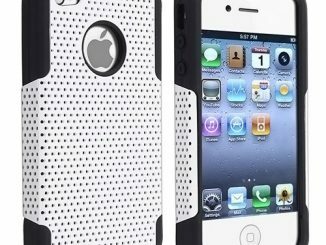 The speakers are covered with a thin metal mesh grill. 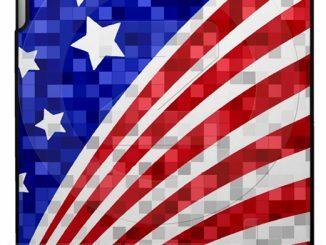 Resist the temptation to press on them or play with them, since the metal is thin enough to be easily dented. 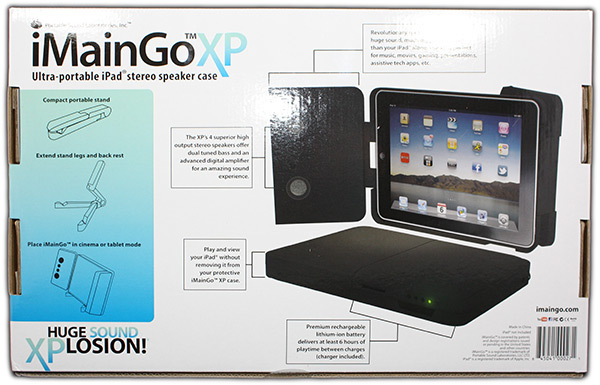 The main point of the iMainGo XP is to provide much better sound, or as they call it, a “huge sound XPlosion!” With a premium state-of-the-art digital amplifier, four 38 mm titanium coned neodymium high output speakers, and bass-tuned ports it certainly delivers much fuller and louder sound than the base iPad. Given the small size and low price, you can’t expect them to match the sound of a high-end home theater system—and they don’t—but they make a huge difference in music, games, and videos on your iPad. Since they are so tiny, it is actually amazing how good the standard built-in speakers are on the iPad. However, after listening to the iMainGo XP and then unplugging it, I was surprised just how tinny and empty the base speakers sound. 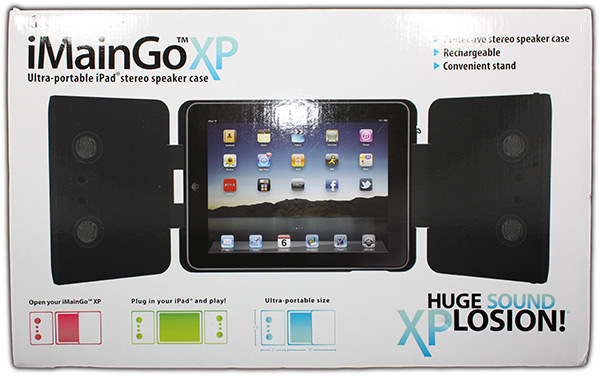 Once you try the iMainGoXP iPad speakers, you’ll never want to go without it again. 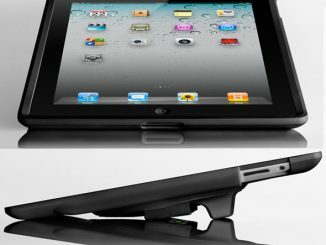 iMainGoXP is perfect if you want to enjoy much bigger and better sound from your iPad/iPad 2. 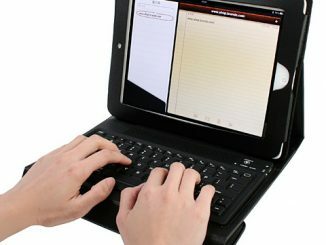 Order the iMainGo XP for $108.14 with free shipping from Amazon.com or for $115.99 with free shipping from BestBuy.com. 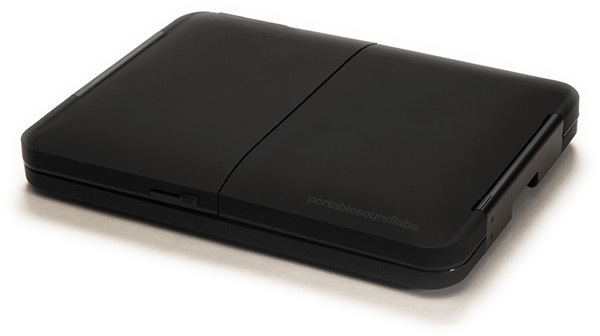 You can also purchase it for $119.95 directly from Portable Sound Labs, where you can save 20% off through December 12, 2011 by using the friends and family coupon code HH202011 at checkout.